I should just rename this site The Chorizo Blog. I know I should stop, meningitis but I cannot help myself. Chorizo keeps well and is always there when I’ve run out of groceries, am too lazy to get more, but still want something delicious for dinner. Besides, Tom is obsessed with it and showers me with endless praise whenever I make anything with chorizo in it. Who doesn’t want that? This week, I simmered a few links of it in some dry, sparkling cider. As the chorizo cooks, it absorbs the liquid and plumps up, losing all of its firm texture and becoming a lot more like the fresh sausage it started its life as. (Ending in a preposition. I know, I know. It’s Friday, so I’m allowed.) The chorizo also absorbs the cider’s sugar, making it savory, sweet and so deliciously addictive. I added cider-spiked chorizo to some sauteed onions and chickpeas, then tossed everything with some pieces of crusty bread. In keeping with the sweet/salty theme (and because it’s all I had, really) I used a cranberry walnut bread. Everything is bathed in an egg mixture, topped with Gruyere and baked until crisp on the outside and chewy on the inside. This casserole feels homey and indulgent and comes together relatively quickly. The hardest part is waiting for it to come out of the oven. Preheat the oven to 400° and grease your favorite casserole dish (I used 4 individual-sized dishes). Heat a large skillet over medium heat and add the chorizos and cider. Simmer for 20 – 30 minutes, or until the chorizo plumps up ad absorbs the liquid. Remove from the pan and set aside. The texture should become more like fresh sausage. You can do this in advance, or make a large batch and freeze the rest for future use. Add the olive oil to the skillet and sautee the onions. Once they’re almost translucent, add the chickpeas. Cook for 5 minutes. While the onions and chickpeas are cooking, chop the chorizo, then add them to the pan. Add the the bread and give everything a big stir, then pour the mixture into your prepared casserole dish. Whisk the eggs, milk, stock and salt together then pour over the casserole dish, making sure everything is evenly coated. Top with the cheese and bake for 40 minutes, or until the middle is set and the cheese is browned and bubbly. I want to sit down after work, with that platter on my lap, and watch Jeapordy. It sounds delicious. Thanks lekkercraft! I wish I had leftovers sooo bad! Genius! Simmering the chorizo in cider: I have to try that soon. Awesome flavor combos. Sounds really yummy. I’m sad to say that I have never made cassoulet in my life. I know, cue the boos. But once winter hits California, I’m gonna make myself my first batch. Great name for a blog :) I loved that song. This is a great looking recipe. Can’t wait to try it this fall. That sounds AMAZING. I’m thinking it’ll be wonderful after picking pumpkins and apples. Thanks for the great idea. Chorizo is a welcome addition anytime, this looks awesome! This looks amazing. I love chorizo too, but I’ve never tried cooking it up with cider. I’ll have to give it a try sometime soon! Thanks everyone! Chorizo in cider is a typical Spanish tapa. So good on its own or in something like this. this is making my tummy growl for it! And I’m stuck with apple oatmeal. Eeeeeeeeeeeeek! Oh my goodness. As a MASSIVE fan of chorizo myself (ate it last night and eating it again tonight) – I adore the idea of cooking it in cider. I haven’t even tried it yet and I adore it. Mel- your dishes are awesome. I am blogging about fixing this for dinner tonight. Chorizo is one of the few things that can get me to turn the oven on in this heat. Thanks so much for the recipe! Helen – I can’t get enough of it! Deb – Thanks :) And I hope it cools down there soon. We’re being stifled by the humidity down here, but thank God we have central a/c. This sounds like an easy and tasty meal! I never would have though to combine these ingredients in a casserole but it sure looks AMAZING! Hi Hillary – I’d love to enter the contest. What’s the link? Yum! I couldn’t find the right kind of chorizo, so I subbed some sausage. I’m definitely fascinated by the cider simmering thing – can’t wait to be able to try it. You are a woman after my own heart. 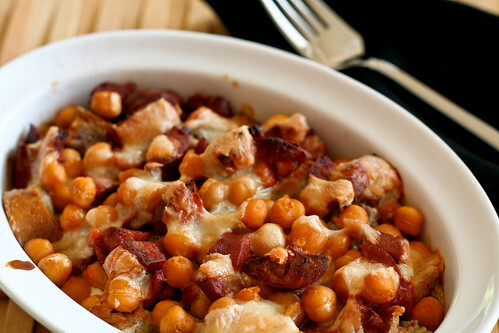 A casserole combining chorizo, chickpeas, crusty bread and gruyere is my kind of comfort food heaven. I’ll be eating the last of the leftovers tonight and I can’t wait. Since this dish is basically a strata I wonder if it could be assembled in advance, refrigerated overnight and cooked off the next day. Thanks for the delicious recipe and a new way to cook chorizo. I froze the unabsorbed cider/chorizo broth for future use as it was so good I couldn’t bear to toss it. Found you via Foodgawker–I just made this last night, and DEAR LORD, I think it’s one of the best things I’ve ever eaten. I had fresh (Mexican) chorizo, so I just took it out of the casing and browned it along with the onions. Thanks for a great recipe!! and that the key letters left out aree “Otis. Finding yourself in the motor crash could be a terrible happening.